Hey Spirit Junkies! As you can tell I’m getting super into my new Miracles Now card deck. I’ve been offering readings at events all over town. Then I offered personal readings on my blog. It’s been a lot of fun, but I confess I was surprised by the huge response! I’m working to get back to you all, but please be patient — it might take a little while, and I want to give everyone a thoughtful response. In the meantime I want to give you all a group reading for the week. In this video blog I asked my Miracles Now deck to give us guidance for this week ahead. I love the direction I received and I hope it serves you greatly. 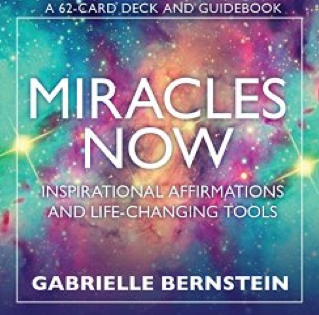 Want your own Miracles Now card deck? Check it out here! You can also get the Miracles Now app on iTunes! Enjoy your affirmations on the go with this hot new app. Get it here. If you have questions or comments about this week’s reading, post them below and I’ll reply! So in love with this card deck and your high vibe messages! I actually ended up purchasing the Miracles Now app so that I could get these messages whenever I needed them, no matter where I was. They are always just what I need to hear! This week’s four “jumpers” are no exception…Thank you!! I can´t seem to find the videolink? 🙂 Sat nam! #1 and #2 are perfect for me as I’ve felt “purposeless” the last few weeks & “old pains” have emerged. Thanks for sharing. Anna from Sweden here???? The readings where all perfect for me, as I will ( problably) give birth tom my third son this week. (Duedate was yesterday) Thank you Gabrielle and universe! ???????????????????????? Oh, sorry about those wuestion marks, Im writing on my I- phone and it was suppose to be ” harts”, dont know why it shows lika question marks ?! Anyway; thanks! I simply adore your cards. Simple messages to begin my day with intention and inspiration. Mahalo. Soooooo perfect for me this week…. I actually felt pain near my heart when I closed my eyes and though about this meesage….the Universe does know what I need and I will trust that I will be guided to where I need to be. Fantastic reading! I am passionate about so many things. I’ve been getting nudges for a “specific” way to proceed, refreshing to see this, this morning as I start my week! Definitely old “pains” from the past are coming up and have been coming up for healing! So these hit home. Thank you. Sending healing love. OOOH! Such a good one! All of these are perfect for me right now. 🙂 Sat nam! I love this! Thank you Gabby!! WOW. Thank you, Gabby. Much ????. I’ve never heard of “jumpers” but I really like it…sounds fun! 🙂 I can’t wait for my deck to show up. I’ve had a jumper and went with it about two weeks ago– I’m glad I did because you just explained. I’m Definitely in sync, since I pulled that one about my purpose finding me yesterday. I love this deck. Thank you! Love, love, love all of these. What fab reminders that we need to feel and tend to our past pain in order to fully release it, trust in the Universe to continue to provide & guide, and do more ‘allowing’ and less ‘manipulating’ to find our way! These definitely all pertain – as I’m dealing with some personal things, as well as deciphering where to ‘head next’ with the biz path. Beautiful! This week seems interesting. I see for us all a lot of inner work plus taking action for our purposes (with trust that Universe has got our back!). Love it. LOVE it. Thank you, Gabby, for sharing your light this week, and every week! You’re such a blessing to all of us! Thank you, thank you, thank you. it is so cool there’s a gabby deck!! Gabby! OK, so I have to tell you this story. I saw you uploaded the video onto YouTube yesterday. My phone notified me of it. So I started watching the video. You pulled the card and chills ran through me, because it was the SAME EXACT card I’d pulled that morning. (I pray and pull one each morning to set my intention for the day.) I dropped to my knees and prayed. I was so happy. I had previously been folding laundry and starting to let my mind wander and I had started feeling the creeping feeling of my worries catching up on me, when something told me to look at my phone. Anyway, I just wanted to share. Thank you! Have a wonderful week. Love the deck and the jumpers! Never heard of that before. I’ve just started a weight loss programme and I seem to have got ‘you are not your habits’ in my miracles now book a lot this past 2 weeks. Spooky huh?! I love the Miracles Now Deck. I have a question on the bundle. Can I only purchase the deck? I already have Miracles Now book in paperbook – unless its been updated since you originally wrote it. I tried to get the deck at Barnes & Nobles on Saturday. They weren’t available there. Will they be making their way their?! I told the manager to order some and she said she couldn’t yet?! which barnes and noble are you referring to? These jumpers were exactly what I needed to hear today and for the week. They align perfectly with my life and struggles right now. You’ve been such a blessing and help to me lately to get me through the challenging times right now. This is amazing however I know synchronicity exists. I am now in the process of cleaning myself from an ancient curse caused by numerous souls and thus releasing those sousl from their grieven and sorrows which have been travelling with these souls for thousands of years now. Since I am a healer these souls have been for quite a while now. And I am glad I will be able to heal myself and surrender myself to the love of God. I will be able to breathe to the other side. Tx for the jumpers angels……!!! Thank you so much for all that you do. The cards are divine! I just finished listening to your Hay House Summit interview and it was so moving. I found myself scrambling to write down many of your teachings as they resonated so strongly within me. The meditation at the end was so beautiful and had me shedding soul-cleansing tears. I hope you’ll see this comment and know how grateful I am for you and the light you bring! When you read #1 & 2 I got chills. The theme today for me has been “relax and know you are being taken care of” I have seen so many posts with that message since I decided to stop trying to find my purpose and focus on the woman I want to be. Just further confirmation that the Universe has got my back! Love you! I have to admit I am some anonymous visitor, I always watch your videos but I don’t usually comment! This time is different I am compelled to share. I just ordered your card, and exactly a year later I am doing again the path of may cause miracles. I am in the positive thinking and law of attraction for almost ten years now, but I never experimented shifts like when I did last year when I first found you. Thanks to your teachings I have done wonders with my life, and my purpose is starting to finding me but I still don’t feel happy, and this is because I never fully allowed my feelings to come up, and sometimes I feel like I am a black hole of anger – sadness – frustration or whatever, and I hate it, but this time I am melting it away just by allowing and observing and this is powerful to see how strong I am for being alive today and reaching what I have been reached even with this unnoticed and suppressed emotions. Guess what I could do if I release it! These cards are fantastic. I selected one yesterday but didn’t like the answer so thought I would try again – only to draw the exact same card. You can’t argue with the universe! Holy S$@T!! I started crying when you read the 4 cards. Really feel like each card is speaking to my current situation. Thank you so much. I excepted it and reminded myself that it is natural to feel pain or sadness, I asked why, and answer was simple: “if you experience the pain, you can recognize the pleasure and know the difference”. Right after this, almost the same minute, customer call me to schedule event photoshoot. This morning I scheduled an other appointment with my customer for event photoshoot. Also this morning I checked my bank account and I see assets deposited to my account. Miracles happen in my life, Gabby! I am so grateful!!! I am dedicated to my daily Sadhna. I normally don’t post anything I just read or listen and let others chat but I have too on this one. As I am posting I am taking chemo therapy for systemic Lupus and it has been a challenge. These cards that jumped out of the pile were such a blessing to my spirit. Thank you Gabby for letting the universe use you too bless others. You made today so much better. Love it!! Thank you Gabby! I waited until Thursday to watch but it was when I needed it! Love! I ordered a deck for myself and for my niece who is graduating high school! Exactly what I needed to hear. Thank you. Gabby! This was the perfect reading for me this week! You don’t even know! I had actually pulled the “I can release ancient pain simply by feeling it” card on my own. But tonight I’ve been very stressed and irritated about not knowing what to do with my life. I graduated last year and haven’t found what I want to do. I want to find my purpose. I feel like I’ve been trying to go with the flow but it’s difficult when I’m someone that likes to have a plan and know what going on. I’m trying to breathe my way through it! Thank you for the perfect reminders! Just received my deck and I can’t wait to start using it! ????? ?